Complete with a teller station, computers, and its own two-person team, the branch was built exclusively for a select group of members: the students and staff at La Pine High School. 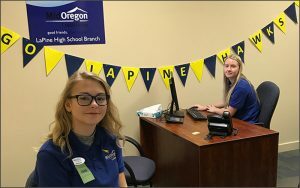 This student-run branch is the first of its kind in Central Oregon as part of a partnership between Bend-La Pine Schools and Mid Oregon Credit Union. It was funded with a grant from the Northwest Credit Union Foundation. The student branch will operate four days each week during lunch breaks with two La Pine High School student tellers. During the summer, both students completed Mid Oregon’s extensive teller training program at the nearby La Pine branch. The in-school location accepts student deposits and withdrawals, can open new accounts, and offers a “Hawks Checking” account — a free account with debit cards specifically designed for La Pine High School students. For many students, this account provides them with their first real-world experience managing their own money. Student teller Stephanie Miller agreed. To learn more about Mid Oregon Credit Union, visit their website. To learn more about NWCUF’s grant program, please visit the program page.